For those of you who don't know, Leonard Nimoy is the actor who has portrayed Star Trek's Spock for more than 40 years. Obama has been likened to Spock's technocratic, deliberative, and emotionless characteristics. 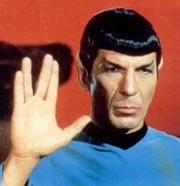 ...The Spock imagery has been especially strong during the extended review Obama has undertaken of Afghanistan policy. He’ll announce the results on Tuesday. The speech’s success will be judged not only on the logic of the presentation but on whether Obama communicates in a more visceral way what progress looks like and why it is worth achieving. No soldier wants to take a bullet in the name of nuance.